This grabber stick is designed with long extension arm and flexible clamp claw which allows you to lift items of all shapes and sizes with ease. 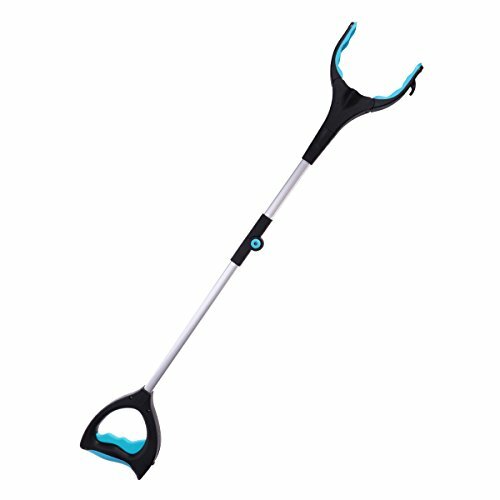 Its ergonomically trigger and handle design makes it easy to operate to reach things you cannot bend down to reach or don't want to touch. Anti-slip claw design. The grabber claw is coated with premium rubber to provide maximum grip strength, able to pick up slippery things like glass firmly and safely without any damage to the surface. Long extendable arm and 90 degree swivel head, making it easy to lift items in high places, small tight spaces or other hard to reach areas. Comfortable contoured grip handle, easy trigger to operate the reacher. Heavy duty aluminum arm, holds items up to 5 lbs. Wide application. Suitable for people who suffer with arthritis, back pain and sore knees, for elders to pickup items in the yard, for outdoor trash picker, for disabled to reach items, for men and women who like to stay at home.